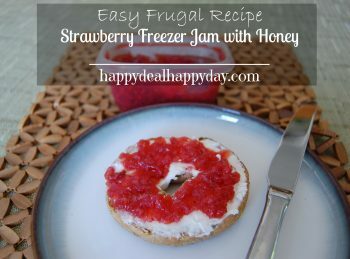 Easy Frugal Recipe | Strawberry Freezer Jam Recipe with Honey | Happy Deal - Happy Day! I recently headed over to my local CSA and picked some organic strawberries. While as a family, we could just eat them all right up, but I did decide to keep a quart just for jam. 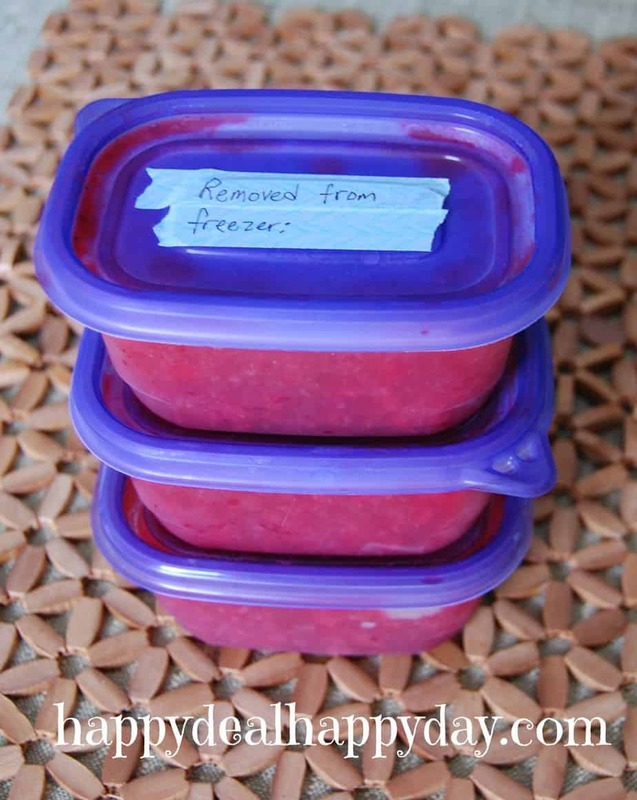 Since I’m not a fan of cooking unless recipes are super duper easy, I decided to make easy freezer jam and share this Strawberry Freezer Jam Recipe with you. I also wanted to experiment and sweeten with honey. It seemed like a shame to sweeten all of those delicious organic strawberries with too much table sugar. Here is a quick and easy way to make delicious, homemade jam, sweetened with honey rather than sugar. Mix crushed strawberries with honey, and let stand for 10 minutes. Start with ½ cup honey, and add more until you reach desired sweetness. This filled 3 extra small ziploc containers. Easily double the recipe for more! The jam lasts for about a month in the refrigerator after you take it out of the freezer. I added some tape and "removed from freezer:" as a reminder to date it when I remove from the freezer. Find more easy and frugal recipe ideas over here! ← FREE Band-Aids at Wegmans!